1. In Egyptian Mythology, Ra is the name of the Supreme Deity. He created Heaven ((Nut) and Earth (Geb). He was the son of Ptah, brother of Toth, and the (Grand-) Father of Seth, Nephtys, Isis and Osiris. When he retired, he gave Seth rulership over Upper Egypt, and Osiris over Lower Egypt. (Other Egyptian myths tell a different story: Ra was the son of Nun and Atum. He got two children, Shu and Tefnut, who became the parents of Nut and Geb. These two became the parents of Seth, Nephtys, Isis and Osiris). Ra was the god of the sun during dynastic Egypt; the name is thought to have meant "creative power", and as a proper name "Creator", similar to English Christian usage of the term "Creator" to signify the "almighty God." Very early in Egyptian history Ra was identified with Horus, who as a hawk or falcon-god represented the loftiness of the skies. Ra is represented either as a hawk-headed man or as a hawk. Ra was father of Shu and Tefnut, grandfather of Nut and Geb, great-grandfather of Osiris, Set, Isis, and Nephthys, and great-great-grandfather to Horus. In later periods (about Dynasty 18 on) Osiris and Isis superseded him in popularity, but he remained "Ra netjer-aa neb-pet" ("Ra, the great God, Lord of Heaven") whether worshiped in his own right or, in later times, as half of the Lord of the Universe, Amen-Ra. SEE ALSO Amon, Geb, Horus, Isis, Nephthys, Nut, Osiris, Set, Shu, Tefnut, Hor-akhuti / Horus. 2. 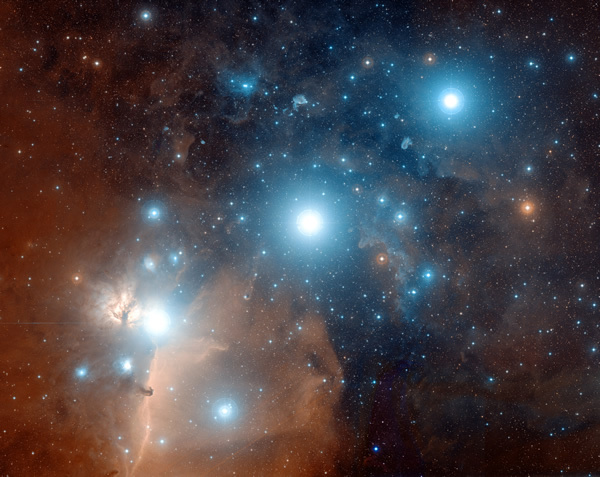 Solara calls Alnitak, the third -and lowest- star in the Belt of Orion, RA. "The RA lineage emanates from the Star system of Sirius. Due to the Sirian experience with the transformation from red sun to white star, they are the overseers of the coming shiftin Solar rulership that will greatly affect our solar system. Together with the other two stars of the Belt of Orion (EL and AN), Ra is part of an intergalactic gateway, called the EL*AN*RA. 3. The RA material also mentions a sixth dimensional group consciousness, called Ra or the Ra. They originially were a third density species that lived on Venus in the days that it was still inhabitable.